Does anyone know how to get rid of dust on photoshop? Yes, I suppose I could have actually dusted, you know, in real life…. But I think dusting a construction site is illegal. If not illegal, it’s definitely stupid…. And I’m definitely not that. Right down to the ‘mop boards’ around the floor. Note the dust….. The only things left are finishing the trim around the door and cleaning the inside of the fireplace. 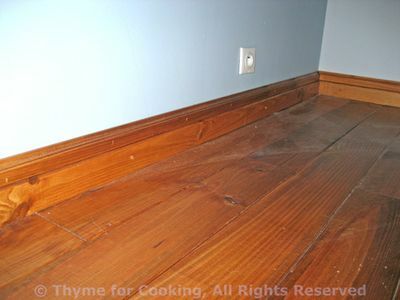 In case you’re wondering, that’s an electrical outlet in the floor. Very handy, that… Floor outlets. We hope to move furniture in next weekend. Right now we’re debating whether to wax the floor first. As the dogs won’t be going into this room, they are not an issue. Poor Sedi, with her almost non-functioning back legs would never be able to stand on a waxed floor. Stop laughing – that’s mean! Not much of note will be happening for awhile after this. 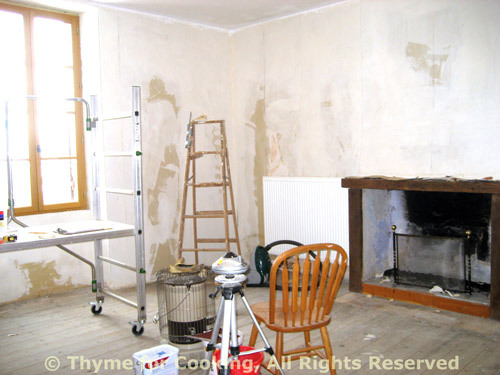 Until the weather warms up and we can open up the upstairs to work it’s going to be all the little jobs that were left undone while the big things got started…. Naturally, I have a list…. Warning: Vegetarians may want to skip this next part. All of you regular readers know that I am rather partial to Foie Gras. My next favorite thing is Magret de Canard, or the duck breasts that come, specifically, from the ducks raised for foie gras. They’re better than steak and are normally cooked the same way and served rare or medium rare. They do have rather a lot of fat on one side making them challenge. In summer when we cook them on the grill the risk is starting the neighborhood on fire (photo here). In winter when we cook them inside…. Well, because of the mess I’ve refused to cook them inside for several years. I am please to announce that I have found a solution: slow roasting. 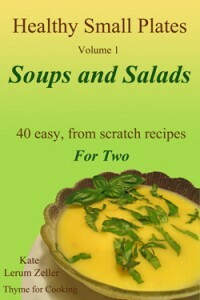 Not only did it solve the problem of the splattering fat, the meat came out perfectly medium-rare all the way through. Even mon mari agreed – it was as near perfect as it could get (without being done on the grill, he said). Even the dogs approved – they got the fat! Score the fat on the magret. Drizzle with soy sauce. Place in a roasting pan. Roast in a 200F (105C) oven for 45 – 60 minutes, to an internal temperature of 125F for rare and 130 for medium-rare. Time will depend on the thickness of the magret. Mine was fairly large, about 16oz (450gr) and I roasted it for 50 minutes. I use an external read meat thermometer. 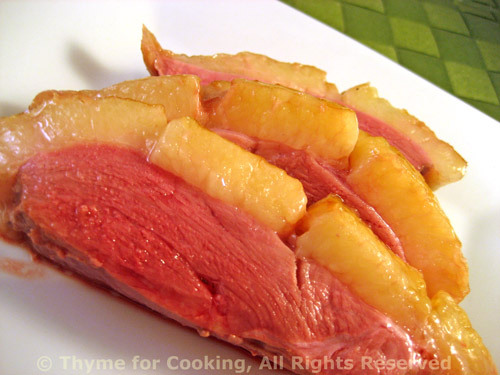 No mess in the oven; no mess on the cook top; perfectly done duck. Yes, the duck– ermm, I mean, the dust. We just had ceilings retextured. The workers put up plastic sheeting everywhere. To keep down the dust. Without thinking about the furnace-AC-heating thingy being inside the sheeting. So everytime it came on, it spewed gypsum and chalk throughout the house. It took three weeks to clean everything up again. So, we now take to white dust on the floor like, well, ducks to water. You can Photoshop the dust by “lassoing” a piece of floor that is dust free and copying it into the dusty space. Takes some practice not to overdo it, but it can be done. The room looks wonderful and when you can open the windows, it will be heaven. I’m so jealous! Here in Australia we can’t really get foie gras or magrets as it’s illegal here. There is some pasteurised, semi-cooked lobes, but I long for the real thing. Lucky you! Oh that fois gras sounds so nice slow cooked. I’m like you, very messy bird to cook, but worth it (here in Quebec we are well known for our duck from the Brome Lake in the Eastern Townships – http://www.bromelakeducks.com/ ). The floors are so nice. Even better, is how the pale blue (almost robin eggshell?) colour on the walls sets off the warmth of the wood. If you keep on posting these pics of your little chateau – you may have to open it up as a B&B – you know who’ll be knocking on your doorstep for a few nights kip! Beautiful!!! (The floor, the room, the magret) – even the dust is lovely; I like the arc formed where the floor is dusted. 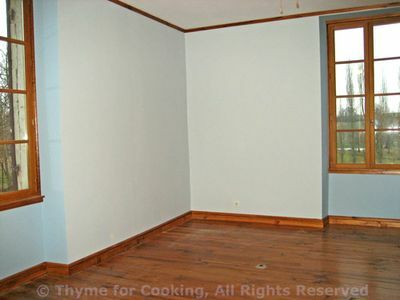 Did you remove the fireplace and replace it with a window, or is the photo taken from a different angle? BorderPundit, that dust is so fine it gets through and into everything – and takes forever to get rid of. Did I say ‘Been there, done that’? Zoomie, but that would be deceptive (she says, aghast) and people would think I was a good housekeeper! Val, I like your idea better…. FatCatAnna, B & B – great idea. We could start now as a build your own bedroom place. Elizabeth, just a different angle. The fireplace is in an interior wall – although I think at one time it may have been an exterior wall. – and Thank!